I have been involved with computers since 1970. Remember those early Mainframes from companies like IBM, Burroughs, NCR, Sperry and ICL. I was an engineer for Burroughs/Unisys and supported both their Medium and Large computer systems. The good thing about those early days was that I had time on my hands to learn the Operating Systems, and Programming languages of the day. I even wrote some of the first online test programs for testing out hardware after it had been repaired. Up time for a computer was becoming important as we progressed into the late seventies and early eighties. As the Hardware become more and more sophisticated some of the challenge went out of the job, as repairs down to component level could no longer be done in the field, and customers were demanding minimal downtime. Whole modules were just replaced and sent back to the factory for repairs. At this point I moved into a Sales Support role, but still continued with my interests in programming and started to sell and support the Print Formatting & Distribution software DEPCON, (Distributed Enterprise Printing Controller) later renamed E.O.M. 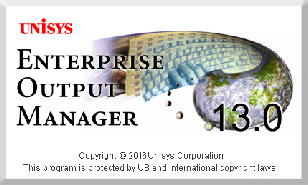 , Enterprise Output Manager. I have now been working with this product since 1997. On the surface printing should be simple, but those who work in that area know it is not. Some standards have evolved over time, but there are still a number of areas where printer manufacturers set their own standards and this can give you problems if you have mixed printer brands, or in some case even different styles of printer from one manufacturer, on your network. I am also trained on the Unisys software development products, LINC and MAPPER. Worked on PC’s since DOS 5.0, installing operation systems, replacing disk drives and installing PC’s on a TCP/IP Network.